Currently the audience for this site is a mix of many different types of people… one trait that we have in common is that you and I are the type of people who have the “need to know” character trait that keeps us going wanting to learn new things daily. It’s a big “problem” of mine (as my wife tells me). Once I get a little taste of something that I find a tad interesting I jump in head-first and learn as much about it and how it works as I can in as short amount of time possible. I do this with everything, even topics that I might not be interested in, but someone else is and I want to be able to help explain there interest to them better.. not because I want to know it better but because I know them and I believe I may be able to understand the topic in a way to help them understand it better… does that make sense? With the 3DPrepper project I intend to share open source projects that catch my eye or things that I am actively using that I believe you’ll find an interest in as well. I also believe that these can help you advance your own projects, give you a kick-start to go all in for that idea you’ve had or even contribute to any of them in your own way. Open Source Ecology (formerly Open Farm Tech) is a truly remarkable open source project. 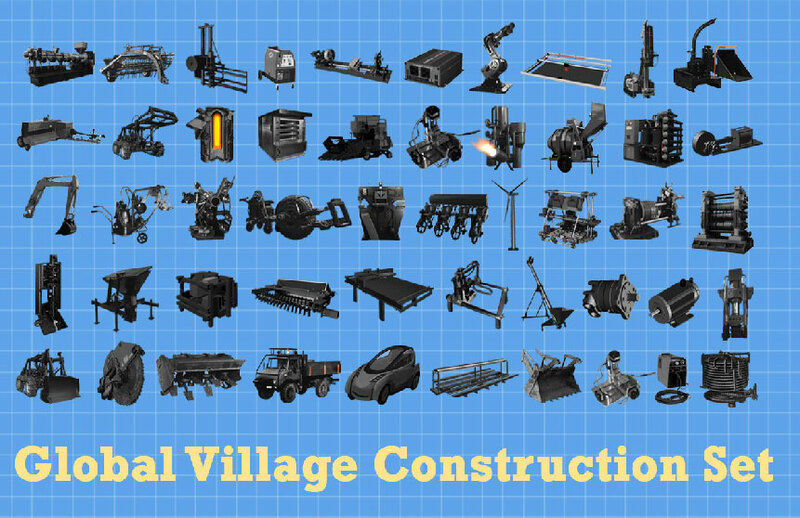 The goal is to FREELY publish the plans to all the things it takes to make create the infrastructure of a society/city: Global Village Construction Set . 50 different machines that it takes to build a sustainable civilization with modern comforts. The are designing them at a fraction of the cost that you can buy them commercially and of course, being an open source project all the designs are available for you to use or modify.. for FREE! I think we may all be familiar with the goal of Defense Distributed at this point.. and they reached it over a year ago with the 3D Printed Gun : The Liberator . Although there is a lot of controversy surrounding Cody Wilson and DD again now with the recent release of the Ghost Gunner we’ve got to remember the main goal here.. To let the powers that be know that 3D Printing is our technology and they are not going to take that away from us. Whatever your stance on gun control we can all agree that these guys have balls… They don’t give up at the first issue as most would. Just recently their payment processor (Stripe) dropped them because their “partners” forced them to citing that “current state of the law around 3D-printing of guns and gun parts is unclear.” (quote source: upstart.bizjournals.com). Because of the next featured project.. there is no stopping open source 3D printing as it is growing fast to become one of the largest open source projects . Ok.. ok… I’ll try to keep the projects here other than the 3D printing type, because that’s what I’ll be talking about the most on 3DPrepper.com, but I’ve got to make everyone aware about in my mind is the sole reason for the whole “maker movement”. The RepRap Project is THE Godfather of all this so-called “3D Printing Hype.” and is what introduced many-a-folk to this open source way of life. It is the first place I recommened people goto when they may have an interest in 3D printing and especially when they want to actually buy a 3D printer. Although there are many good 3D printers out there that you can buy and go to town on right away it is so much more beneficial to learn how to build your own printer.. and then build it yourself than it is to just plug it in and push print. Since you’re a reader of 3DPrepper.com I know you’d rather be able to fix your own printer than have to rely on some BS warranty offered from some BS company such as #Takerbot [Makerbot] (which wasn’t always BS btw… more on that later) that has a new promotion for all you Makerbot owners.. a “3 pack of SMART extruders to keep your downtime to a minimum!” OMG + LOL!!!!! What a freaking dissasster! I literally couldn’t believe their marketing genius’ came up with that slogan.. Thanks to +Jereme Francois for sharing this amazing deal on G+! Anyway.. RepRap is the motherload and everyone should bow-down. As a self-sufficient minded person you are always looking for ways to repair and build things on your own and Mr. Steve Spence has been doing this for years. He’s covered everything from building a Gas Sensor to a Thermostat to security systems and has been living off-grid for years as well. The project has many followers, and you can join in on the G+ group as well. Not only will you learn about coding and electronics, but how to think like an engineer. Highly recommend you follow the work of Steve Spence and Arduinotronics. Yes.. I know that this one isn’t just some small open source project, but to me it is one that needs to be shared. Remember those computers you spent >$3K on back in the 90’s? Well the Raspberry Pi Foundation figured out (more specifically Mr. Eben Upton) how to shrink them down into the size of your wallet and decrease the price down to $35! The Raspberry Pi project is helping humankind to a major effect. People and kids are doing so many different things with these little computers. When I said it really is a computer, it is. In fact, you don’t even need to use a mouse and keyboard you can SSH or remote into it and use it from there. It runs Linux in GUI mode if you wish although best used through the command line as the video suffers somewhat. The best thing is.. You can run the latest OctoPi on it right away to have your wireless 3D printing setup in no time. There are a few different models out there now and I suggest you order one right away and start playing with it. I use them for media centers, web server, and of course OctoPrint. There are many awesome open source projects that are out there.. these are just a few that I wanted to bring your attention to right now as I stated in the title of this post. I intend to feature all kinds of different things on 3DPrepper.com and I intend to help you grow your own knowledge in open source technologies and help you become more self-sufficient in doing so. You may not have an interest in every project featured here but maybe one of them or even somebody who is working on one of them can help inspire you to finish your own project or actually get your project started. You know there is no better time than NOW to start that project… and if you’re trying to finish one then there is nothing more true. I hope this gives you a small short overview about just a small sampling of the open source projects that are out there and if you know of some that I should feature or look into please let me know! That’s the biggest and most amazing part about open source-ness.. The community! Open source grows the more people get involved and contribute to it. The projects you see mentioned above have many many people dedicated to them who do everything from beta testing, to troubleshooting to hosting the projects, etc… Go ahead jump right in. 3DPrepper's "3DC" (3D Printing Every Day Carry)My 3D printing Kindle book: 3D Printing for Preparedness - out NOW! What is the Ghost Gunner? Jason is an open source 3D printing enthusiast who intends to bring valuable open source and 3D printing knowledge to the self-sufficient and preparedness community.